Fermentation chemicals are widely utilized in a broad range of industry applications and chemical processes such as pharmaceutical industry, alcohol industry, chemical industry, rubber industry, food and beverages industry, and textile industry among many others. Owing to their low cost, better outputs, and natural structure, fermentation chemicals find applications in several industries across the globe. 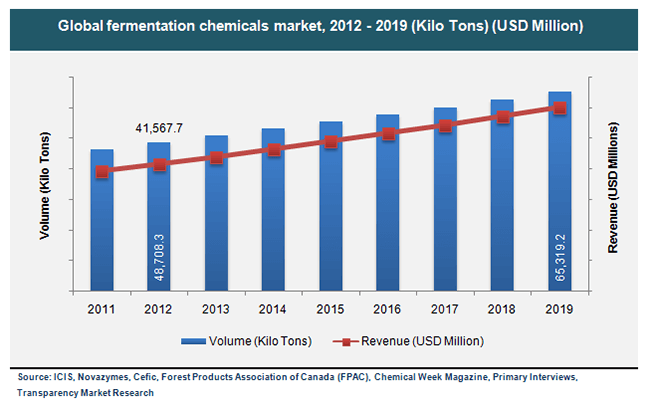 According to the primary and secondary research conducted by the market analysts at TMR, the global fermentation chemicals market will show a promising pace of growth for the period ranging from 2013 to 2019. The global demand and drive for the eco-friendly nature of fermentation chemicals, increasing number of industrial applications, and rising environmental concerns are some of the major factors expected to instill number of market opportunities in the fermentation chemicals market. The growth in this market will be brought about by robust demand in different product segments and applications. The report covers detailed outlook on the fermentation chemicals market by segmenting the overall market based on its product segment analysis and application segment analysis. Some of the major product class of fermentation chemicals consists of enzymes, organic acids, alcohols, and many others. Among the many segments, alcohols accounted for the largest market share in 2012. This product segment was followed by high growth in other segments such as the organic acids and enzymes during the same year. The total revenue generated by the alcohol segment of fermentation chemicals market was US$22,377.1 million in 2012. The alcohol segment accounted for nearly 53.8% share of total consumption fermentation chemicals in the same year. Apart from the alcohols market being the biggest product segment of fermentation chemicals, some other types of segments including vitamins, xanthan, and antibiotics are also very attractive within the global fermentation chemicals market. The report also addresses the market for fermentation chemicals in terms of application segments which includes Industrial Applications, Food and Beverages, Nutritional and Pharmaceutical, Plastics and Fibers, and Others. The industrial application segment held the largest market share in 2012. This sector accounted for nearly 45.2% share of total consumption fermentation chemicals and generated revenue worth US$18,765.7 million in 2012. Some other major end-user application segments of the fermentation chemicals market such as the pharmaceutical, cosmetics, and food and beverages dominated the global fermentation chemicals market too. Consumption for food and beverages has been the highest so far, and thus high and positive growth is driven in this industry segment across the global fermentation chemicals market. Additionally, the strong demand from cosmetics and pharmaceutical industry is becoming a growth driver for the fermentation chemicals market. Based on regional analysis, the regional segmentation includes the current and forecast demand for different regions such as Asia Pacific, North America, Europe, and Rest of the world (RoW). Among the various geographies, North America represents the most significant and largest market for the fermentation chemicals industry. In the recent past, growth in this market throughout this region was driven by surging growth in the pharmaceutical market in the U.S.
On the other hand, Asia Pacific is the second largest market for fermentation chemicals, subsequently followed by Europe and RoW. Due to the trending market saturation witnessed in the European and North American markets, Asia Pacific region is expected to be the future potential market until the end of the forecast period.